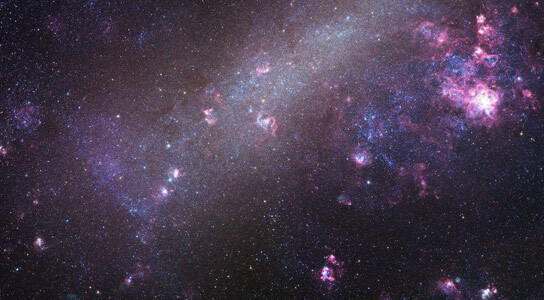 Astronomers have identified 18 extreme mass-ratio binaries in a neighboring galaxy called the Large Magellanic Cloud, pictured here. The more massive stars weigh 6 to 16 times as much as the Sun, while the less massive stars weigh about 1 to 2 times the Sun. We’ve caught them “in the delivery room,” since one star is fully formed while the other is still in its infancy. These systems represent a new class of binary stars. Astronomers from the Harvard-Smithsonian Center for Astrophysics have discovered a new class of binary stars; one star is fully formed while the other is still in its infancy. Cambridge, Massachusetts – The majority of stars in our galaxy come in pairs. In particular, the most massive stars usually have a companion. These fraternal twins tend to be somewhat equal partners when it comes to mass – but not always. In a quest to find mismatched star pairs known as extreme mass-ratio binaries, astronomers have discovered a new class of binary stars. One star is fully formed while the other is still in its infancy. “We caught them at just the right time. In effect, we’re seeing these stars in the delivery room,” says lead author Maxwell Moe of the Harvard-Smithsonian Center for Astrophysics (CfA). The more massive a star is, the brighter it shines. This makes it difficult to identify extreme mass-ratio binaries because the heavier star outshines, and thereby hides, the lighter star. To combat this effect Moe and his CfA colleague Rosanne DiStefano looked for eclipsing systems, in which the two stars line up in such a way that they periodically pass in front of each other as seen from Earth. When the fainter star eclipses the brighter star, their combined light drops detectably. These systems are rare because they require a precise alignment as seen from Earth. 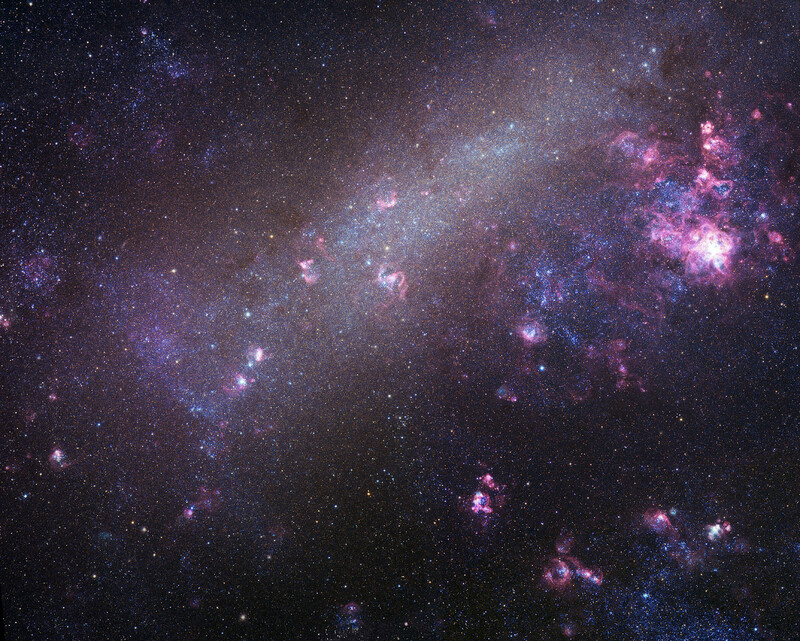 After sifting through thousands of eclipsing systems, they identified 18 extreme mass-ratio binaries in a neighboring galaxy called the Large Magellanic Cloud. The stars circle each other tightly in orbits with periods of 3 to 9 days. The more massive stars weigh 6 to 16 times as much as the Sun, while the less massive stars weigh about 1 to 2 times the Sun. A clue to the young nature of these systems came from an unusual feature in the data. The fainter star shows illumination phases, just like phases of the moon, as the two stars orbit each other. This indicates that the companion is reflecting the light of the brighter, more massive star. A star forms when a giant clump of gas pulls together under its own gravity, growing denser and hotter until nuclear fusion ignites. This process happens faster for more massive stars. “Imagine if a human baby shrank as it got older instead of growing. That’s what happens for young stars,” says DiStefano. In the young systems this research identified, the more massive star is already on the main sequence, while the less massive companion is not. As a result, that companion is puffier than it would be, since it is still contracting. This effectively lets the pre-main sequence star act as a giant mirror, reflecting the brilliance of its partner. The discovery of these stellar twins could provide invaluable insight into the formation and evolution of massive stars, close binaries, and star nurseries. These 18 systems were culled from millions of stars in the Large Magellanic Cloud observed by the Optical Gravitational Lensing Experiment. Due to their rarity, finding examples in our galaxy likely will require an extensive survey using facilities like the upcoming Large Synoptic Survey Telescope. Be the first to comment on "Astronomers Discover a New Class of Binary Stars"